Federal Court To Weigh Graphic Cigarette Labels A federal appeals court considers Tuesday how far the government can go in forcing a business — in this case cigarette makers — to warn consumers about its product. The FDA wants large, graphic warning labels on cigarettes to scare smokers, but tobacco companies say that violates their right to free speech. This image provided by the U.S. Food and Drug Administration shows one of nine new warning labels it wants cigarette makers to use. Tobacco companies have sued, claiming the mandate is unconstitutional. 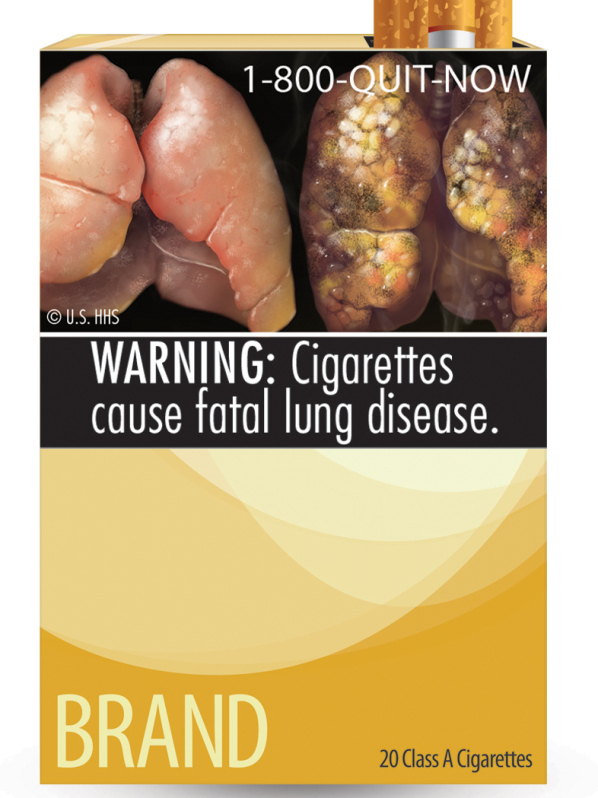 Diseased lungs, gnarly rotting teeth, even what appears to be the corpse of a smoker are some of the images that accompany the bold new cigarette labels the FDA requires to cover half a pack of cigarettes, front and back. The written warnings include: "Smoking Can Kill You" and "Cigarettes Cause Cancer." "It's going beyond I think what is necessary," says David Hudson, a scholar at the First Amendment Center in Nashville, Tenn. "It's just so in your face, so graphic, these images — it's just simply too much." That's what Congress intended when it mandated the labels in a 2009 law that gave the FDA the authority to regulate tobacco. Susan Liss, executive director of the Campaign for Tobacco Free Kids, says the idea is to counteract the tobacco industry's track record of misleading smokers. "We are dealing with an industry with a decades-long history of deceiving the public about the health risks of smoking, and the enhanced warning labels are a direct response to the deception of the industry," Liss says. Washington, D.C., federal Judge Richard Leon blocked the FDA from implementing the labels, siding with cigarette makers who sued over their right to free speech. The judge questioned whether the government had crossed the line into advocacy by using such graphic images. The fact that an image is evocative shouldn't matter, says Matt Myers, the president of the Campaign for Tobacco Free Kids. "The picture of somebody that is dying from tobacco can be an accurate representation of the health effects of smoking, even if it evokes an emotional reaction," Myers says. Tobacco Free Kids and other anti-smoking groups have filed a friend of the court brief with the D.C. appeals court, arguing that the new labels are in line with the FDA's power to warn consumers about dangerous products. FDA officials and the tobacco companies declined to discuss the case, but it is one being watched by constitutional scholars because of the nation's mixed case law when it comes to protections for commercial speech. Another federal appeals court has already upheld the cigarette warning labels as constitutional. George Washington University professor Jonathan Turley says the threshold question is how far the government can go to compel commercial speech. "These graphic images are really the government getting into marketing and trying to force companies that have lawful products to use repellant packaging," Turley says. He says other businesses should be paying attention. "Cigarettes are not the only harmful product," he says. "Can they, for example, require a picture of a cirrhotic liver on a wine bottle or any type of alcoholic beverage?" The ultimate decision will likely be determined by the U.S. Supreme Court.